Over the years, especially in the last few weeks via PM's/emails, I have been asked how I bed deck hardware with butyl tape. I officially apologize for being so slow with completed photo examples. I have been meaning to do one but just have not had the time to complete it. Late one night I was in the barn staring at a cleat, and a small scrap of clear Lexan, hmmmm...... A drill, counter sink, some butyl tape, my camera and a few minutes later I had the pics I needed. Sorry it took so long it just needed to "click" the way I wanted to present it.. Here's how I bed with butyl. Step 1 - Countersink the deck holes slightly and then clean everything with Acetone or a similar fast evaporating solvent. If you look close you will see two spider cracks radiating out from the drilled hole in the deck. If this hole had been beveled/countersunk this would likely not have happened. The big money builders learned this trick a long time ago. So why on earth do I countersink or chamfer the deck side of the skins? #1 it does a lot to prevent gelcoat crazing. 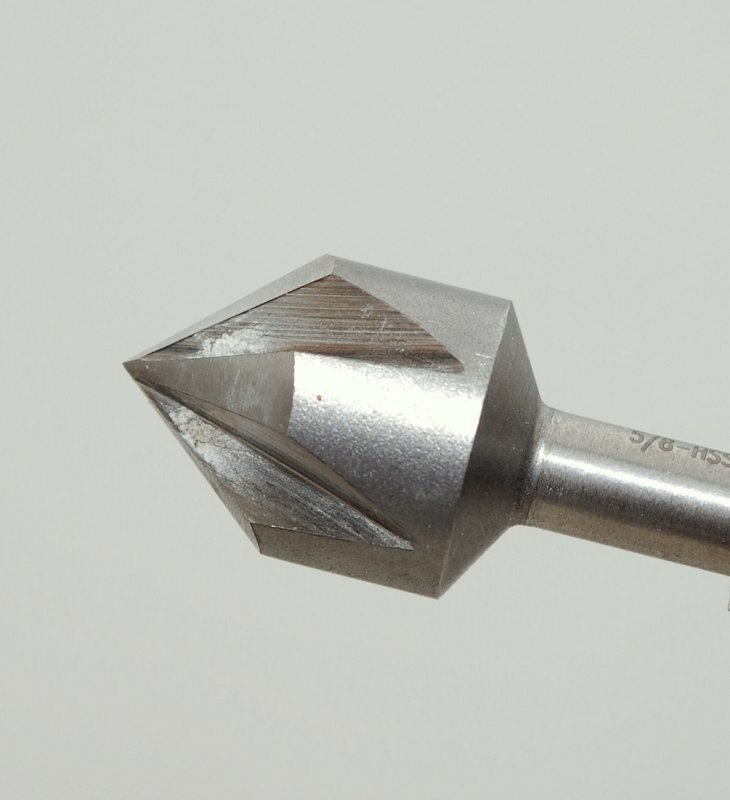 By feathering the edge of the gelcoat, through the use of countersink bit, you are now a lot less likely to start a crack or craze mark in the gelcoat. Gelcoatt is an unreinforced product and because of this its prone to cracking. Sharp right angle holes are a good place for these cracks to begin when you tighten the deck hardware and potentially flex the substrate. Beveling the edge of the hole or feathering it limits the ability of the crack to begin or start. This is why you often see holes drilled into plate glass that will have beveled or rounded edges too. #2 By creating a bevel or countersunk recess in the surface of the deck the marine sealant or butyl tape has a cavity to fill. Without a bevel the hardware would compress the sealant to about 1/64th of an inch thick after the fasteners are tightened. Marine sealants do have some flexibility but not as much as you would guess. Follow me for a moment; Let's say you have a marine sealant that has a rating of 400% elongation before break on a 1/64" thick joint. Simple math shows you that 400% of 1/64" is only 1/16" of total allowable joint movement before a joint failure or leak starts. In the case of a stanchion base 1/16" is not much allowable movement before failure. #3 By countersinking around the bolt holes you increase the maximum thickness of the sealant, at the bevel, to roughly a 3/32" depth at it's deepest point. Using the same math as above 3/32" X 400% gives you a total joint movement before failure of 3/8". If a mechanically fastened joint is moving 3/8" you have more problems than just a deck leak! So 1/16" allowable movement before failure at 400% without countersinking or 3/8" allowable movement at 400% before failure with countersinking. Even a small bevel will drastically increase max allowable movement before failure. 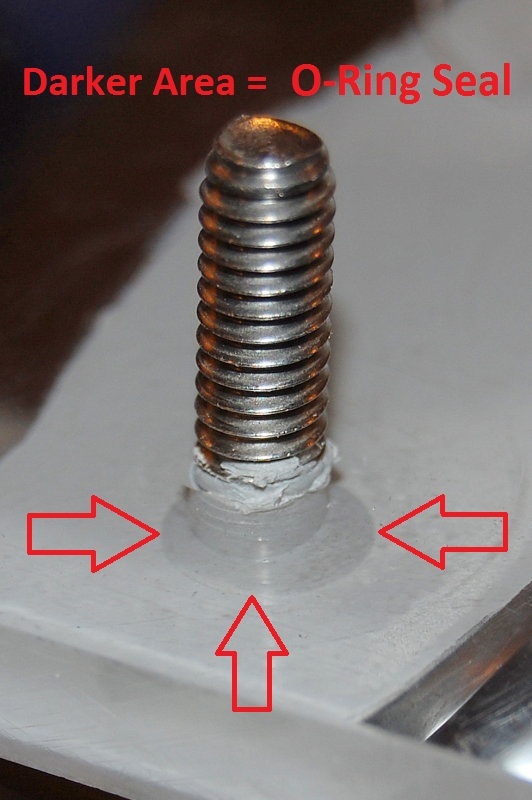 Countersinking to a mere 1/16" depth will give you 1/4" total movement around the bolt before failure. You don't need a deep bevel to make a large difference between a failure and a seal. #4 Countersinking is a no brainer and has many many benefits. For instance, you can install the fitting and tighten it down NOW with no waiting and you can seal deck hardware alone. Think about it? If the sealant cures, to form a "gasket", and you then move the bolt while tightening it down on the "second step".... you lose! Sorry, I mean no disrespect to Mr. Casey, and he writes some excellent stuff, but this method is perhaps some of the worst advice I've ever read in any sailing/boating related book. I have witnessed far too many cases of core rot due to poorly executed professional and DIY "two step" bedding installations than I would have liked to. So where did I lean this very simple countersinking method? Hinckley Yachts. Hinckley, Morris and other top quality builders have known this secret for years but many of the big production builders are still either too cheap or just don't know about it, which I find very hard to believe. Sure this extra step takes all of about 30 seconds per stanchion but apparently it's too much "extra" work for most production builders. Here's a prime example of where the 1/16" of movement might make a difference. This is a stanchion base on a major production sailboat that was only two years old. The factory marine sealant, made by 3M, has failed and caused a void when the stainless plate flexed and bent. This is another reason I prefer cast stainless or aluminum stanchion bases as they do not flex like plate stainless does. On top of the stanchion base bending this manufacturer also does not countersink the deck holes, which in this case resulted in wet deck core in under two years! Had the deck penetrations been properly countersunk there is a very high probability that this leak never would have occurred despite the cheesy quality of the stanchion base.. 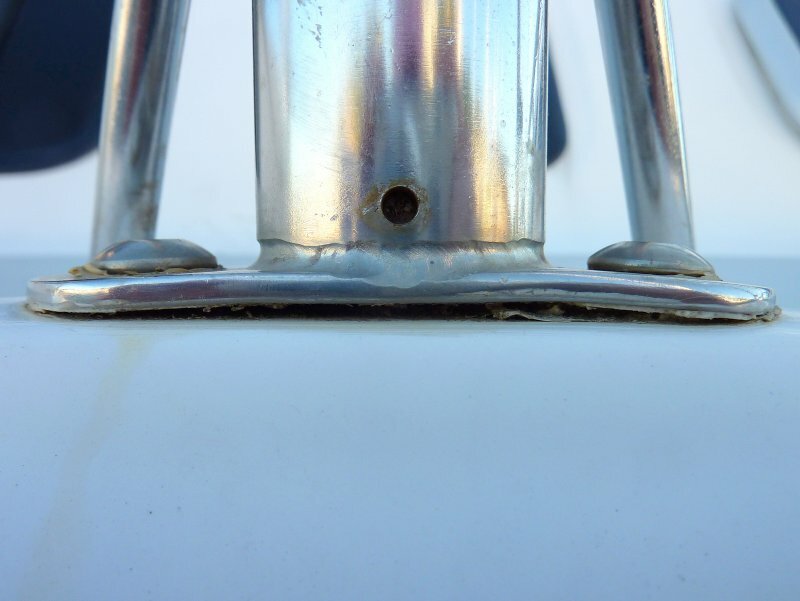 If by chance you're reading this and are still not convinced about countersinking, this is a lifting eye I installed in 2002 for an inflatable RIB dinghy. To do this install all I did was bevel the outer hull with a countersink bit, clean the surface with acetone and install the fitting with 3M 101 polysulfide, tightened it down ONCE and cleaned up the goop that squished out. This fitting has been bone dry for eight years and resides below water, as in COMPLETELY SUBMERGED, when the dinghy is floating. 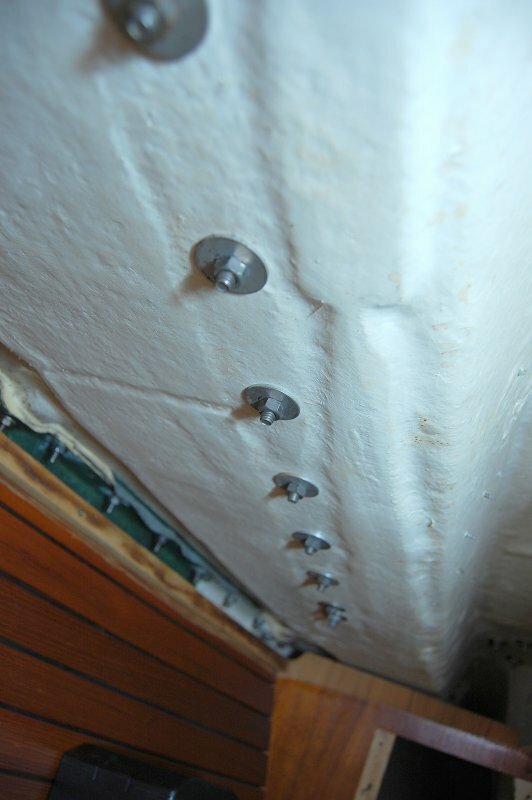 If you're still not convinced in the utility of countersinking the holes in your deck this photo was taken at year 8 of these pad eye's being installed and they still exhibited ZERO leaks and are still 100% bone dry. While you probably could use butyl below the water line I don't, and use marine sealants instead such as Sikaflex 291 or a Polysulfide instead. 3M-101 is no longer marketed so you are left with Boat Life Life-Calk as the sole marine grade polysulfide. I never liked Life-Calk as much as 3M 101 but it's still better than "Satan's Glue", AKA 3M 5200. This is EASY! 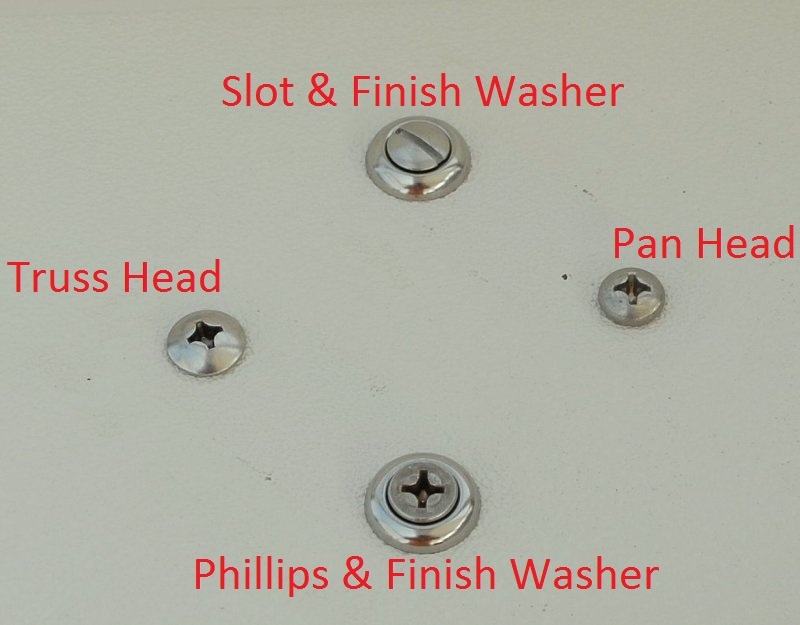 Countersink, clean, tighten & clean up.... Done! Okay, okay still not convinced? Here's how the pro's do it. 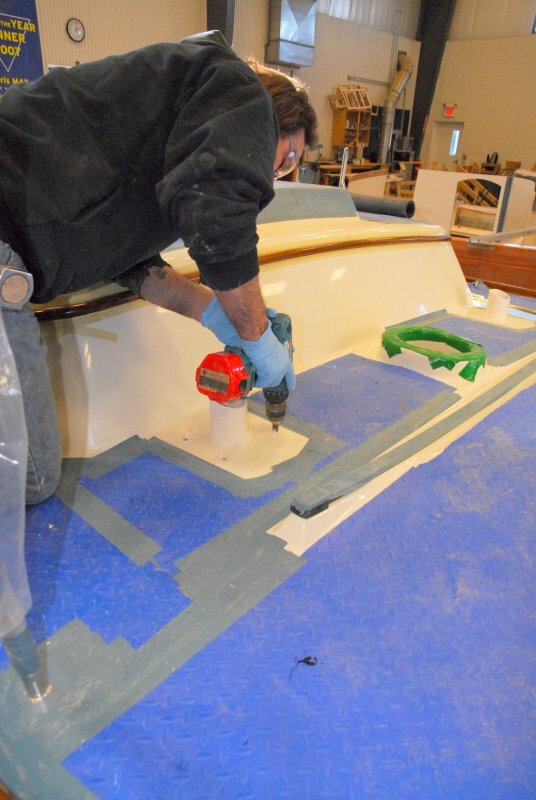 I took this photo at Morris Yachts of a brand new Morris during the deck hardware installation. These four holes are for the Dorade box on an M-36. It is utterly reprehensible to me in this day and age that the production builders are so bent on saving $0.02 that they won't take the extra 30 seconds needed to properly install deck hardware. It took this Morris Yachts craftsman less than 30 seconds, including installing the countersink bit into the chuck, to bevel these holes. 30 seconds!!!!!! Four properly countersunk deck penetrations on a brand new Morris. 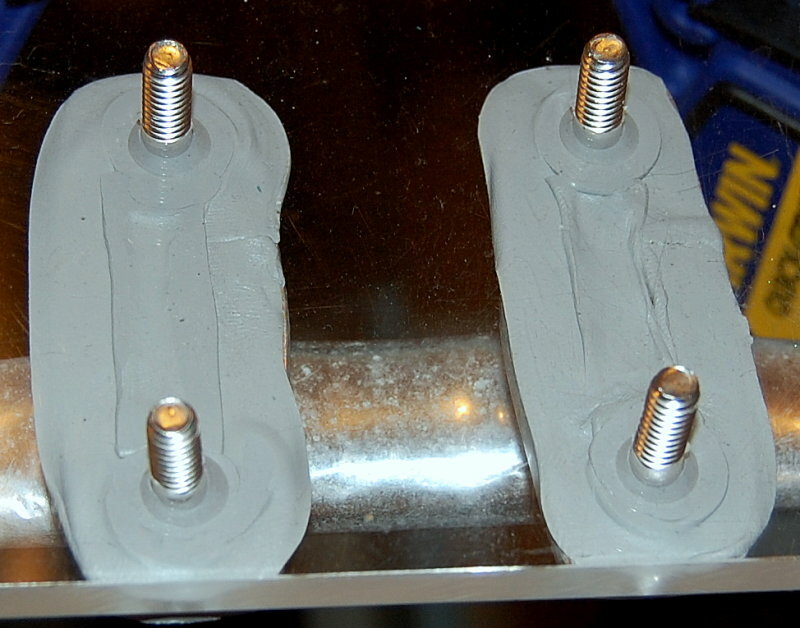 Step 2 - Wrap Bolt Heads - You'll want to rip off a small piece of butyl and knead it into a string then wrap the underside of the bolt or machine screw head. Step 3 - Press the through bolts into deck hardware with some good pressure. First though make sure the hardware is clean, Acetone works well, but if Silicone was previously used you'll really want abrasives as Acetone won't touch dry silicone contamination. Gelcoat silicone contamination is a whole other subject for a whole other day. Please avoid silicone except for certain tasks involving plastics that requite its use. Once the bolt heads are wrapped and pushed through, flip the hardware over. Step 4 - Strip some more butyl tape and make another round string. Wrap the string around the bolt threads or shoulder. Knead and work & twist the cones into the threads of the bolt and shape them like a cone. Step 5 - Apply butyl tape to the rest of the base. It is perfectly OK to stretch and pull on the butyl while laying it on in order to make slightly thinner. For this project I used 1/2" wide by 1/16" thick gray butyl tape. Step 6- In colder climates you may want to pre-heat the butyl to soften it some. After pre-heating with heat gun on the warm setting line up the bolts with the holes and press the hardware firmly onto the deck. For illustrative purposes clear polycarbonate was used in place of a deck, another Compass Marine first, but don't worry one of the magazines will surely rip this idea off in no time. This photo allows you to see what actually happens when you bed with butyl. 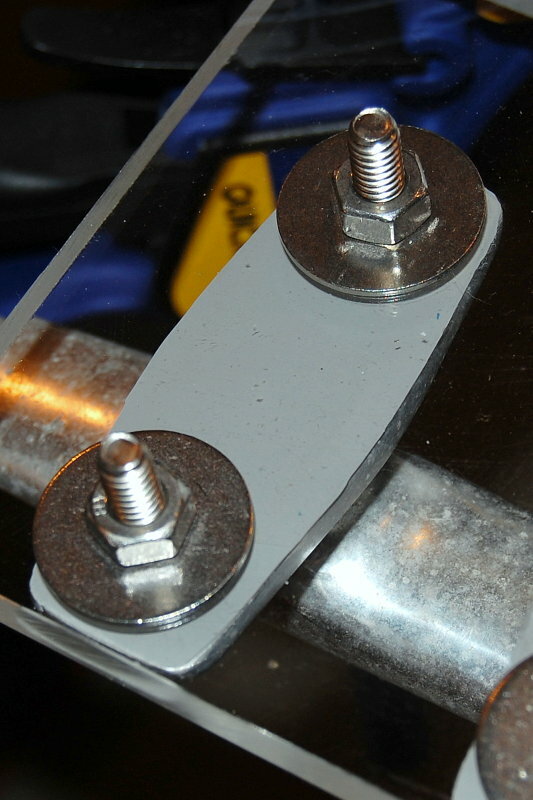 Step 7 - Install the backing plates, in this case I just used fender washers, and begin to tighten. Please use suitable backing plates. 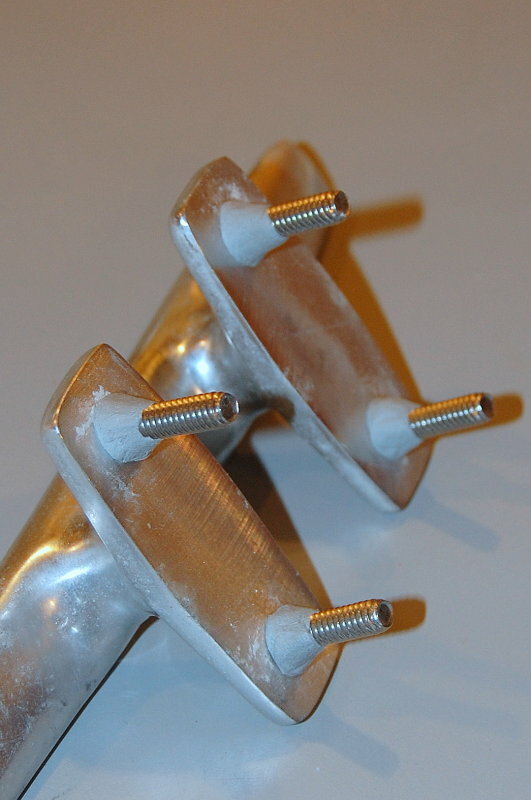 These fender washers would not be the best choice in a stanchion or deck cleat as they are far to thin and a little on the small side diameter wise for a cored deck. You will be best to have two people or a good way to keep the bolt from moving. 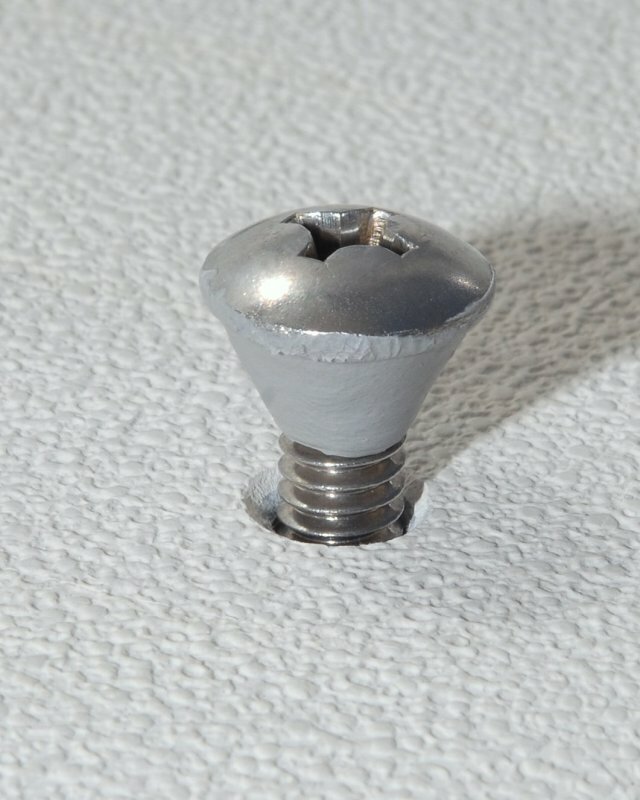 Ideally you do not want the machine screw or bolt to spin, but if you absolutely have to, you can slightly soften the butyl with a q-tip and some mineral spirits and go for it. 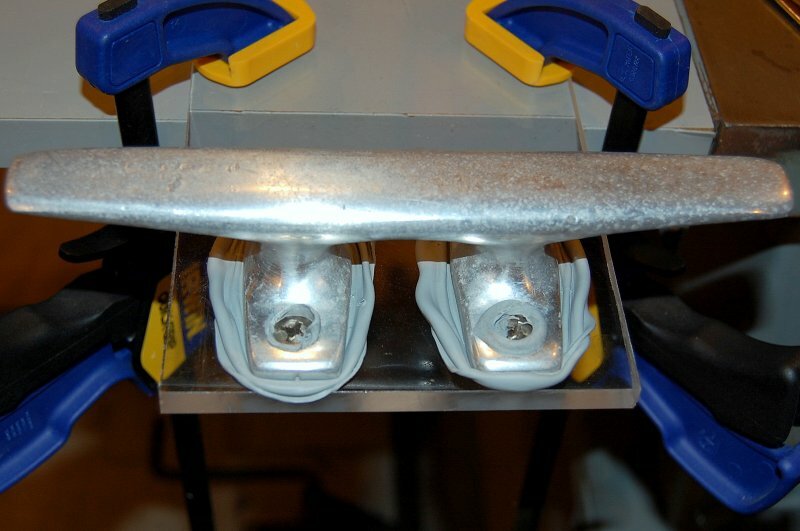 Tighten the hardware a little bit at a time as the butyl will ooze out slowly because the consistency is quite thick. Tighten, let sit, tighten, let sit etc. etc.. When little to none squishes out & the bolt & nut become tight you can stop. If you have a wood deck core DO NOT crush it by over tightening, better yet bore out some core and pot the hole with thickened epoxy. Here, I have taken pictures of the underside when tight. As I mentioned in the last photo please use properly sized backing plates. This is a prime example of DIY boat work gone bad. Ouch!! This stanchion base had NO sealant of any type installed, not polysulfide, not a polyurethane not butyl and not even the dreaded silicone. 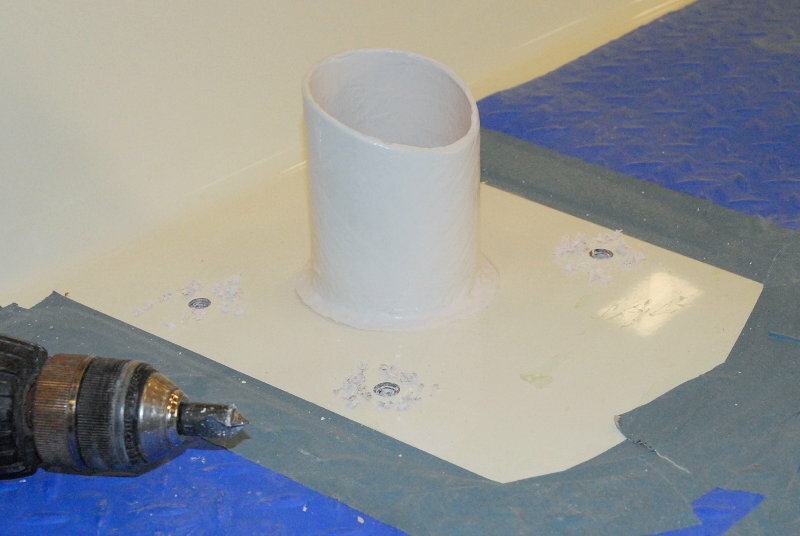 After tightening, the excess butyl will squeeze out around the edges. The easiest way to clean it up is to pull or peel it away first. Use some of the excess butyl to make a small ball that you can then make quick stab & pull motions at the remaining oooze around the fitting. 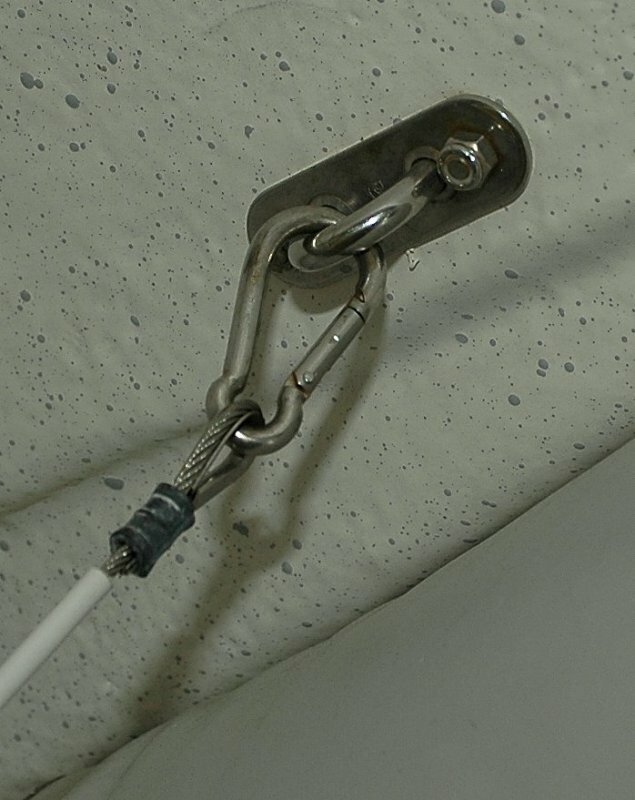 This quick stab & pull with a butyl ball in hand motion will get about 85-90% of the butyl cleaned up. Step 8 - Peel away excess ooze and clean with Meguiars cleaner wax, or a rag slightly dampened with mineral spirits. 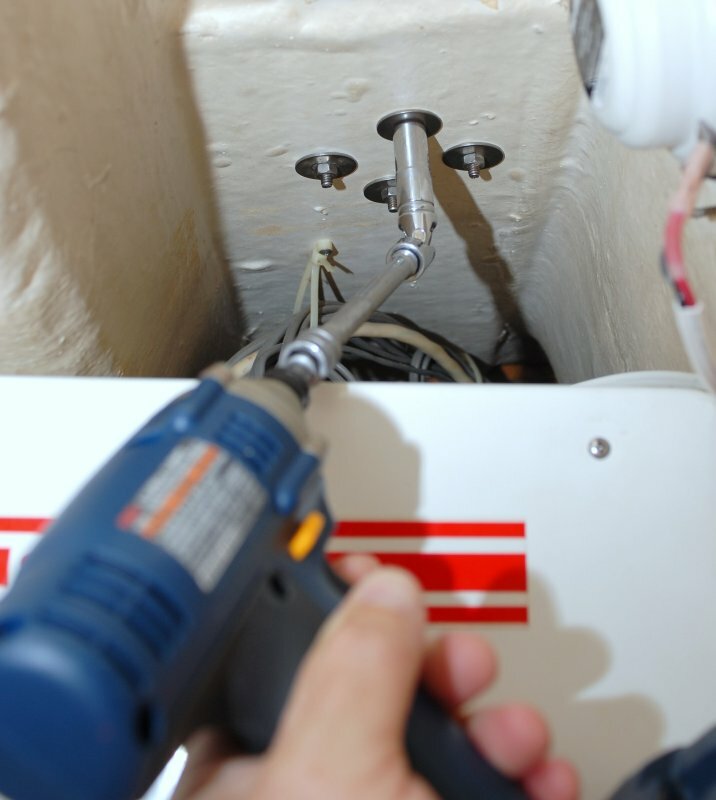 Do not saturate the rag with mineral spirits as it can creep under the fitting, just damp. I find a ball of already "peeled" butyl works well at pulling away excess using a stab and pull motion. Stab the ball into the joint and pull away. The butyl will stick to the ball first and usually peel away from the joint. Alternatively you can use plastic razor blades or scrapers. Contrary to popular myths about bedding all the butyl does not squeeze out from between the surfaces even after the fitting is fully tight. This is the magic of butyl, but it does take multiple small tightening events, ideally without letting the bolt spin, to get the vast majority of the butyl to squeeze out. This is the view after tightening to full tight, and then removing the nut and washer. You can see how well it actually seals, and that it does NOT all squish out, as rumored to for years, if you tighten to full tight. 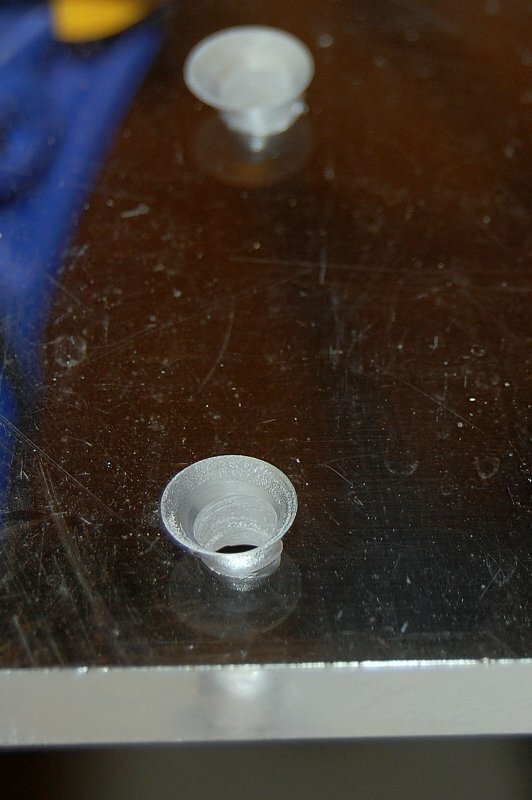 You can also see the o-ring seal of thicker butyl created by countersinking & the butyl cone. 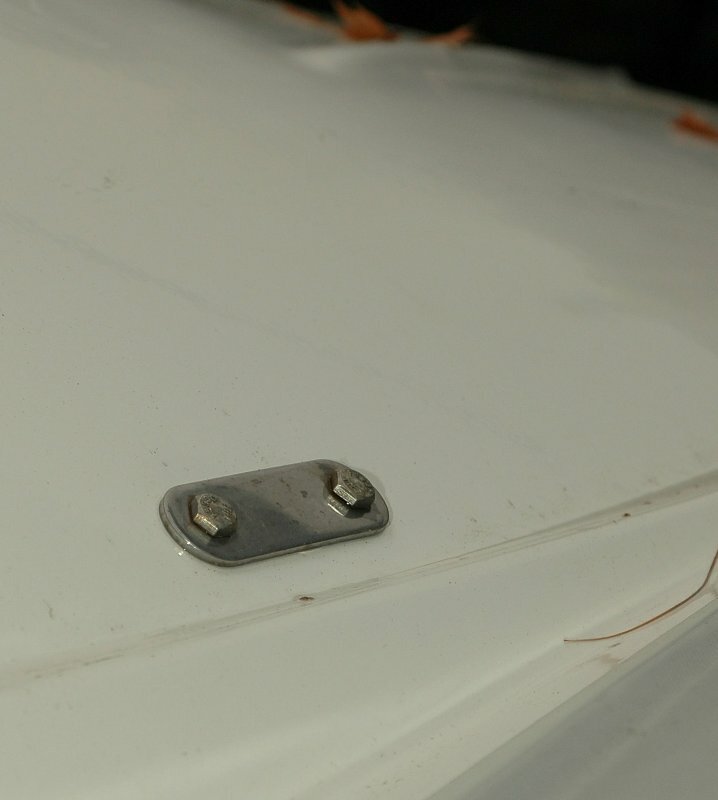 The butyl o-ring created by countersinking the deck side is evidenced and can be seen by the darker colored ring of butyl around the bolt. 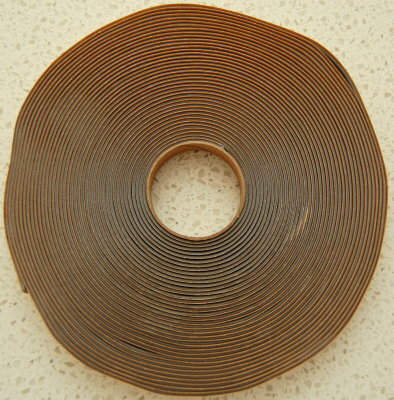 This is the gray butyl tape I use. It is 1/16" thick by 1/2" wide. It makes an excellent bedding compound. Many builders used to use butyl tape, CS Yachts and many others did, but they all stopped because butyl in a production environment is significantly more labor intensive despite being a better mouse trap. #1 It never hardens and remains at the same thick consistency for well over 30 years. #2 Because it never hardens it always remains flexible. #3 It is multiples more flexible than a cured polyurethane. #4 It sticks extremely well to clean gelcoat, plastic, aluminum, bronze or stainless. #5 It's NOT a glue, and for through bolted deck hardware you do NOT need a glue. This thinking I know is contrary to the brain washing we have received by the polyurethane marketers like 3M, but it's true..
#6 You can easily remove hardware bedded with butyl tape in the future without destroying your decks. #7 When you open a $16.00 - $20.00 tube of Satan's Glue or similar, and don't use it all, it quickly goes bad and gets hard. Butyl tape can still be used ten+ years later. I bought two cases back in 1997 or 1998 and was till using those rolls this past spring with no problems what so ever. That is a HUGE cost savings..
As I mentioned butyl tape is VERY, VERY flexible. This photo represents well over 1000% elongation of the original squished thickness and the butyl is still stretching and much of it has not yet failed. You will also notice that it is still perfectly adhered to the deck and the cleat and never let go of either despite its very low 10-20 PSI bond strength. When compared to Satan's Glue/3M 5200 and its gelcoat destroying 700+/- PSI adhesion you can see why this ridiculous level of adhesion is 100% unnecessary. Butyl tape also cleans up easily. Remove the fitting and clean the surface with mineral spirits and a rag. That's it! Because butyl can be softened with mineral spirits the one place I won't use it is on fuel fills or fuel vents. 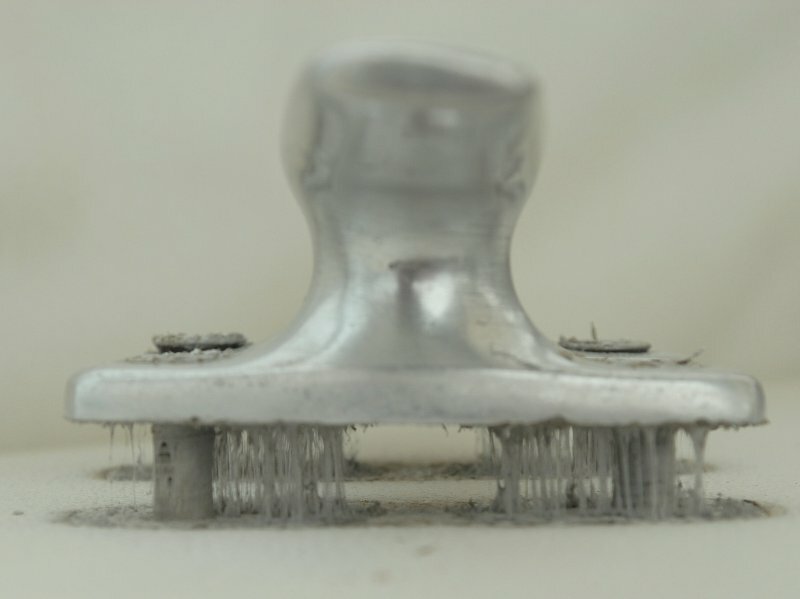 If you normally clean your decks with potent solvents, doubtful, then just be careful around the butyl bedded hardware. 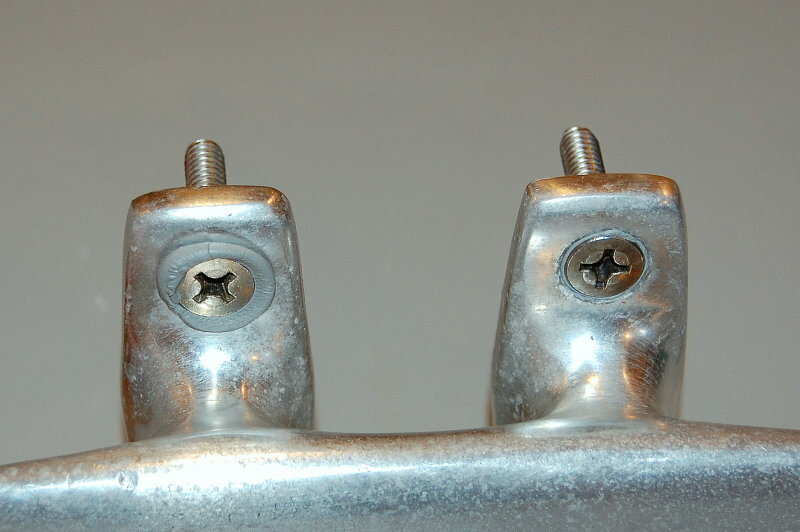 Here is a look at the below deck view of that cleat pictured above. This cleat had been bedded 29 years prior to this photo with butyl, and frustratingly, with no beveling of the holes. Despite the lack of countersinking/beveling it was used for 29 years covering over 50k+ nautical miles and never once leaked a drop. Butyl is an exceptional sealant and the deck, even after 29 years and 50k+ miles, was still 100% bone dry, not delaminated and confirmed dry with a moisture meter and soundings. You can see the pure white core and no signs of moisture damage. Anyone who has been around boats for a long time knows what the back side of a deck looks like when the backing plates come off and the fitting has been leaking. Trust me, it looks nothing like this. 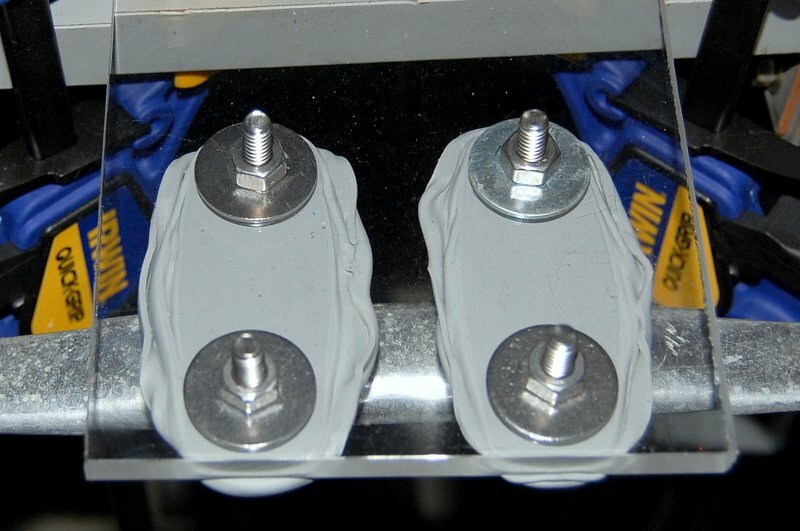 Butyl tape, a deck cleat that sees tremendous loads, no countersinking and yet 29 years of service later and BONE DRY! No rust, no brown goo, no signs of any leakage. I re-bedded much of a 2005 Catalina in 2006 and the vessel already had multiple deck fitting leaks. This is 100% inexcusable on a 1 year old vessel! Properly installed butyl tape, in my humble opinion, is a far superior deck sealant than any of the polysulfides or polyurethanes currently marketed for above deck applications. Though with either butyl, polysulfides or polyurethanes they will all work very, very well IF properly installed. 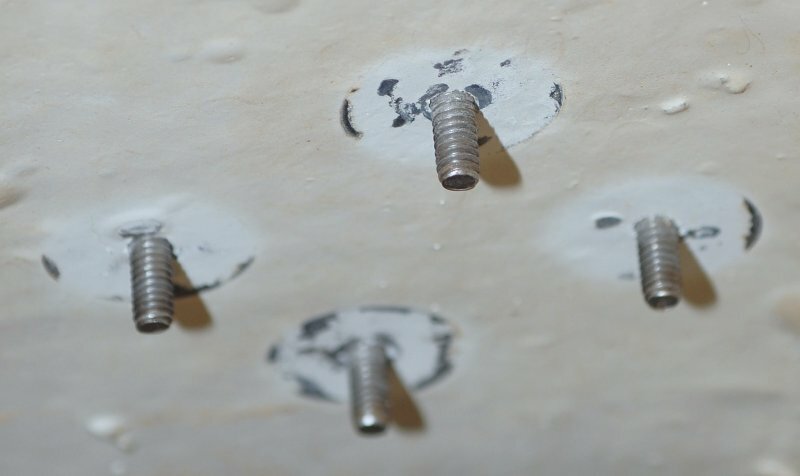 "IF PROPERLY INSTALLED" being the key words and properly includes countersinking the holes. All deck hardware will eventually need re-bedding no matter how good your sealant is. Why make things more difficult than they have to be in the future by using Satan's Glue (AKA 5200) that has a 700 PSI bond strength? Why do this when a product with just 10-20 PSI will achieve at least the SAME and more often BETTER results or outcomes without all the headaches. Keep in mind that 3M 5200 can actually bond to the gelcoat more strongly than the glecoat is bonded to the fiberglass substrate! Unnecessary bond strength? Absolutely! Think about this, the Satan's Glue marketing mavens at 3M have probably driven millions of dollars in repair revenue for boat yards and have actually spawned & supported an entire business dedicated selling polyurethane/ 3M 5200 removal products! Again, ridiculous! :doh: This level of adhesion is 100% unnecessary. Just one last bit of evidence as to why I prefer butyl tape for deck hardware over Satan's Glue or its extended family of misfit relatives. This is the genoa track on our CS-36T as photographed at year 31. The track is still bedded with the original butyl tape she left the factory with in 1979. The track, 31 years later, is still BONE DRY, does not leak and has not leaked in 31 years and 50,000+ nautical miles. We run a 150 genny most of the year, just as the previous owner did so this track sees some heavy loads. I've seen some less than 4 year old boats bedded with Satan's Glue or its relatives dripping wet with rust stained bolts and wet core at year four and sometimes earlier. 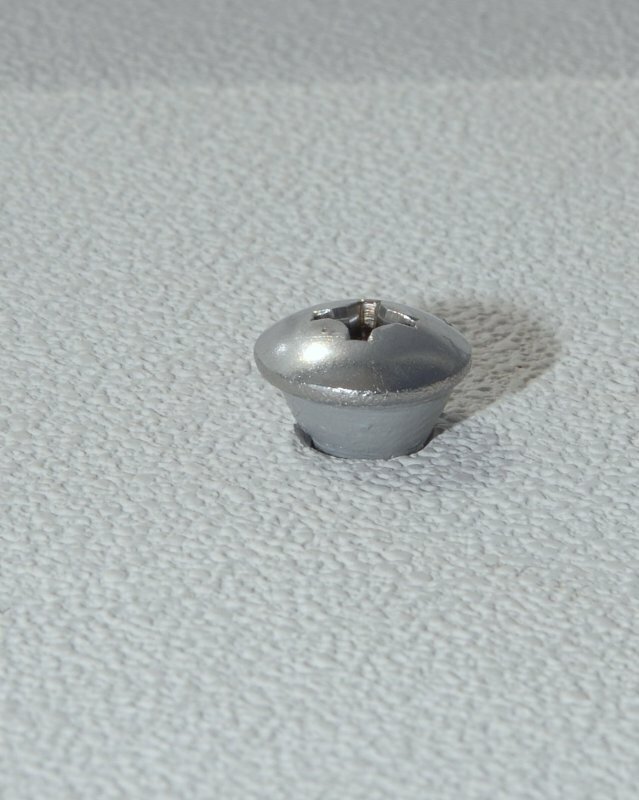 This genny track was installed without countersinking the holes. Just an aluminum genoa track bedded with butyl tape in 1979. Bevel the holes and it will probably go 70 years without a leak..
Just a quick tip on removing hardware. 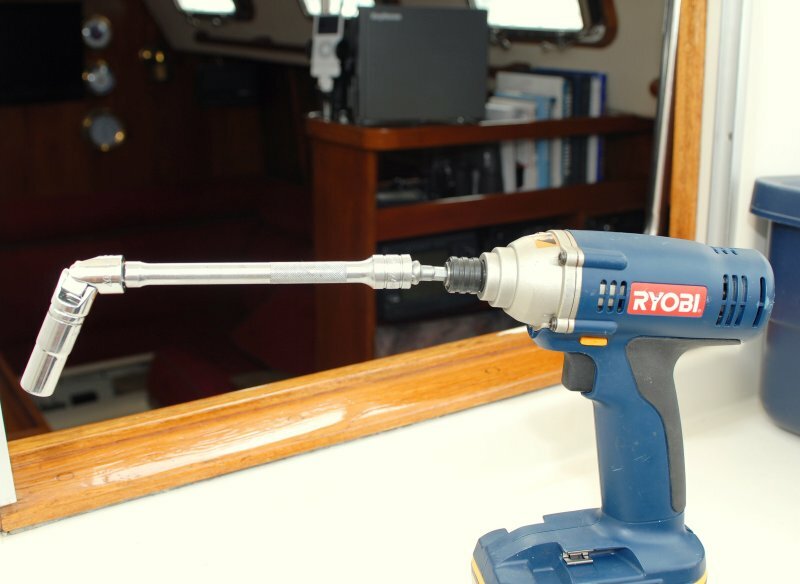 A cordless impact driver can make short one person work at removing the nuts on the inside of the boat. 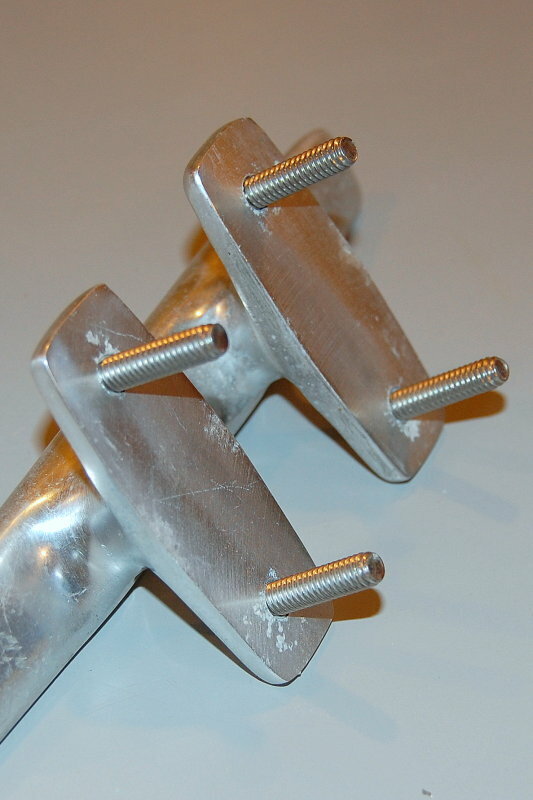 For stanchions and other hardware I often re-install them with hex head bolts rather than Phillips or slot headed screws. This allows me to tape a wrench to the deck using Gorilla Tape to keep it from moving then hit the inside with the impact driver, wrench or socket wrench. If you use the impact driver to re-install pleas DO NOT over do it. These tools are powerful and fast. I would advise against the use of one for re-installing the hardware until you know you are competent with it. Impact drivers work via hundreds of rapid fire quick impacts or beats per minute sort of like a machine gun. These small, short, very fast beats or impacts will almost always break a nut free from one side without even using a wrench or screw driver on deck. This is one of my impact drivers, it's a cheap Ryobi and does the job. While I much prefer the quality & torque of a Li-Ion powered Makita, Bosch, Hitachi or other premium brand I won't lose sleep if I hand this one off to Davey Jones and that kind of Li-Ion torque power is just not necessary here..
One last trick. 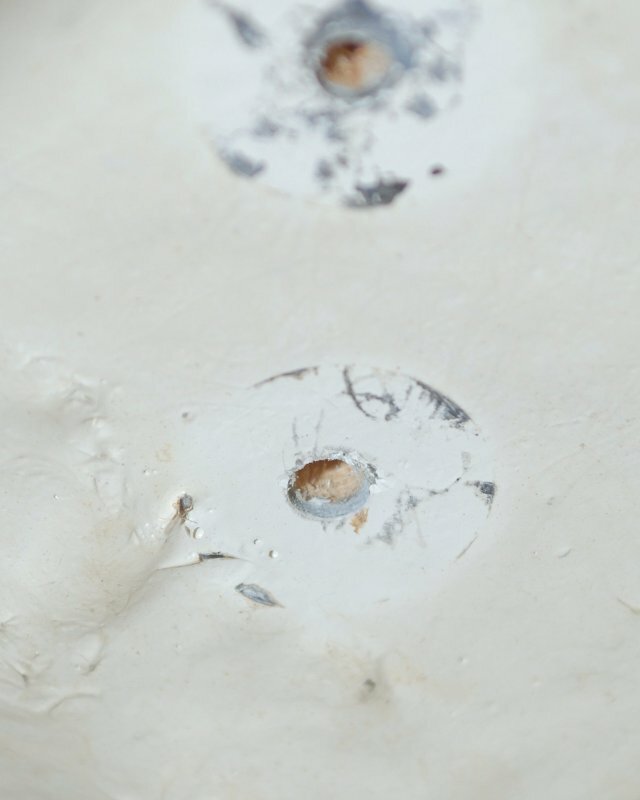 We've all removed old hardware from a boat only to be left with a hole in the fiberglass. You can try to patch it with gelcoat, and may succeed, or you may make it worse if you're not well versed in glecoat repair. Here's a quicker way to get back to boating. 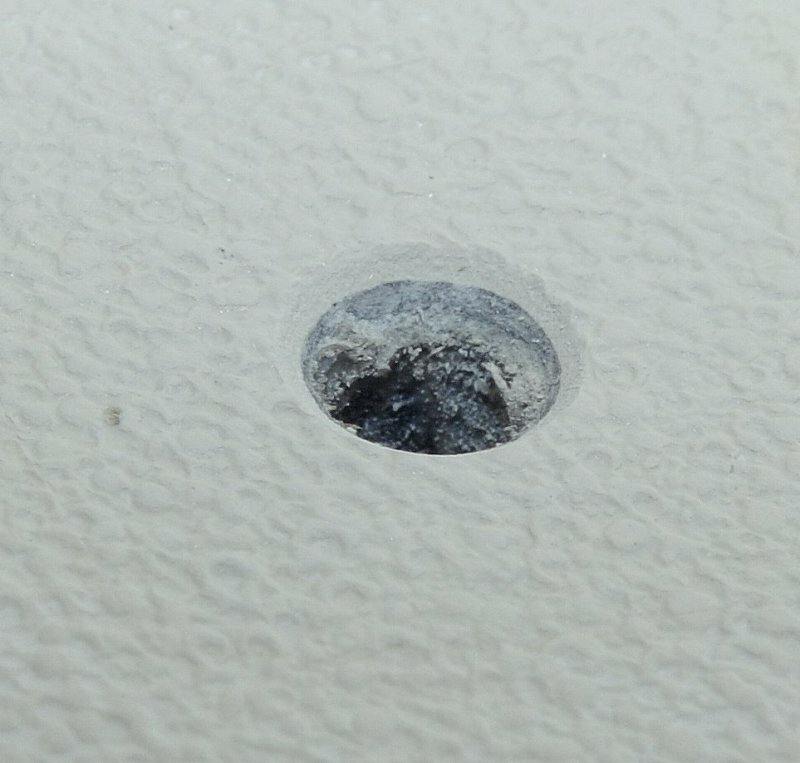 Simply countersink the hole then use a truss head machine screw, or your preferred style, and butyl tape to cover & seal the hole. 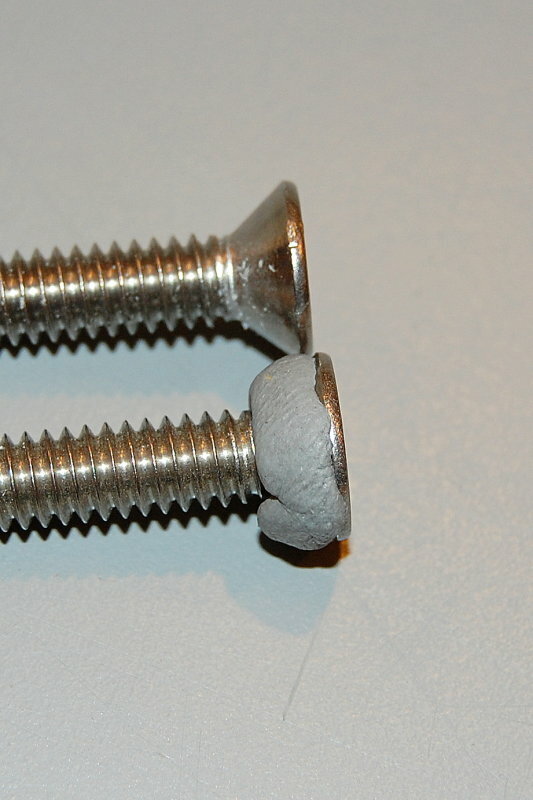 Truss head machine screws are available from most nut and bolt suppliers like Fastenal. 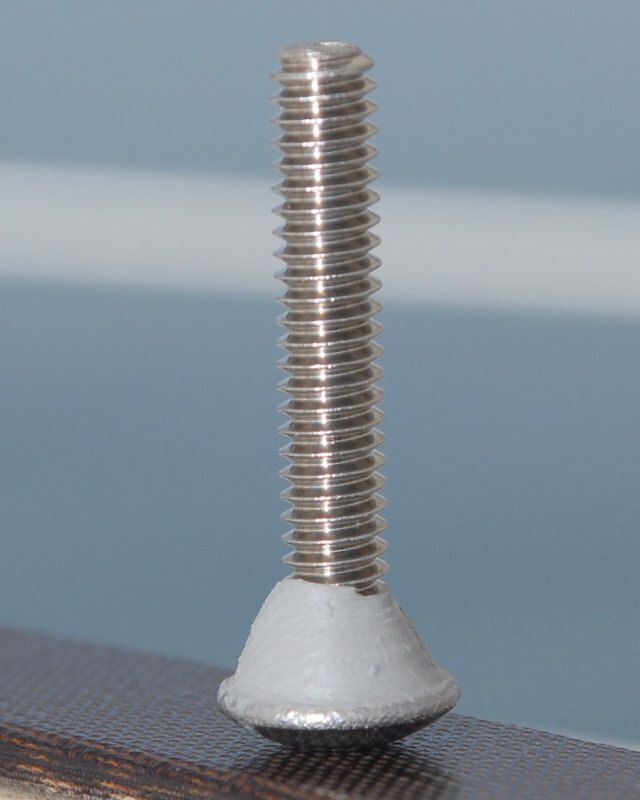 Truss head machine screws have a much wider and lower profile head than a pan head machine screw. The truss head machine screws lend themselves well to plugging old holes with butyl tape..
First make a butyl cone around the head. Choose your weapon. I prefer the truss heads as I feel they seal better and will have less potential for leaking. They are also very low profile and make for a somewhat professional looking band-aid..
Clean the surface and insert the butyl wrapped machine screw. You can see the cone fitting nicely into the beveled hole. Have one person hold the screw head with a screw driver to keep it from spinning then go below and install the nut and washer and tighten it down..
#1 SEALANT ON DECK - Don't bed or use sealant on the inside of the deck. If it leaks you WANT to know about it. By sealing the backing plate side or the inside of the boat you can force the water into the core, if its not sealed. You can also cause any trapped water to become starved of oxygen. 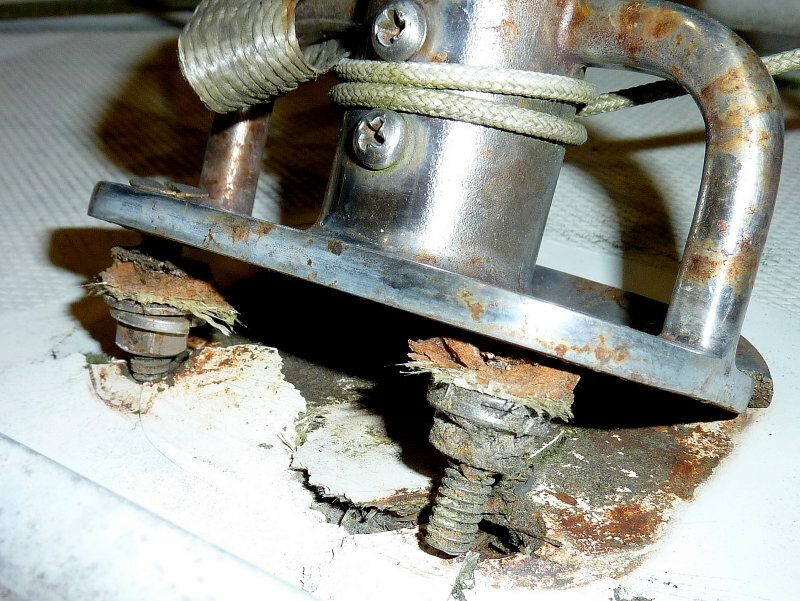 This can lead to pitting or crevice corrosion of the stainless bolts potentially leading to a catastrophic bolt failure. Only seal the deck side. #2 TIGHTEN ONCE - Whether you use butyl or a tube type sealant Please do not listen to the old wives tale about letting sealant cure and then tightening it a second time. While in "theory" this sounds all warm and fuzzy, but the raw reality of the real world is that this is a disaster waiting to happen. There is a much easier way! Countersink the deck hole and tighten it ONCE. As I ranted about above, the "let cure, tighten twice" advice is perhaps the absolute worst advice ever foisted upon the unsuspecting boating community. Messed up attempts at this method run rampant and this has perhaps been the cause of more deck leaks than if you were to use Swiss cheese to bed your fittings. Though I strongly suspect Swiss cheese might actually work better. I have had a moisture meter on lots of DIY and "professionally" bedded "tighten twice" boats and there is huge correlation to "tighten twice" and wet decks, HUGE. #3 SILICONE - Avoid silicone! There are only two situations where silicone should be used and that is for bedding acrylic dead lights or plastic fittings that are damaged by polysulfides or polyurethanes such as Beckson products. Dow 795 or similar should be used for acrylic ports/dead lights. Silicone contamination of gelcoat is very, very real. It is nearly impossible to clean and remove silicone from gelcoat and auto body products intended for metal are not safe for gelcoat. To effectively remove silicone from gelcoat requires judicious manual cleaning then wet sanding rinsing the paper frequently to clear it of silicone traces so you don't grind it deeper into the gelcoat. To test if the silicone is gone spray the area with a misting bottle of water. If the water beads it is not clean. A friend owned a mid eighties Catalina where the previous owner had used silicone to bed the chain plates. Even after re-bedding they leaked every year for about four years straight. He had even resorted to tenacious glues like 3M 5200, still it leaked. He finally called me to discuss it and we simply masked off the surrounding areas with 3M film tape and ground and sanded away the silicone contamination. The chain plates have been dry since. Lesson learned, the silicone must be COMPLETELY removed before any re-bedding. If you think you've cleaned dry silicone with Acetone, De-Bond or any of the other products folks claim have worked guess again. Over many years I have tried nearly every chemical under the sun to remove silicone contamination and the only thing that works is a thorough manual cleaning and sanding. 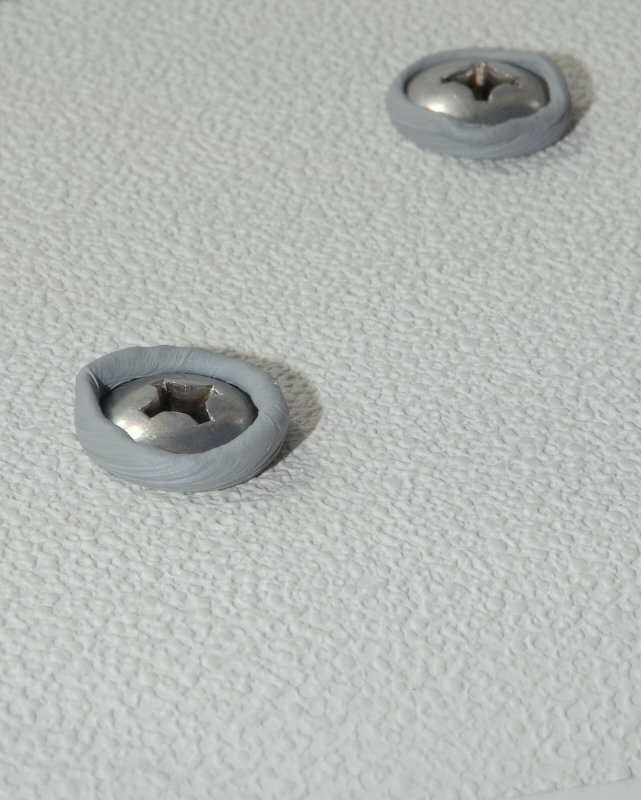 If you want to almost guarantee that the fitting will leak the next time you re-bed then go ahead and use silicone. Please, if anyone knows of a product that will remove dried silicone from gelcoat let me know. As of yet every "sure fire" silicone remover touted to me has failed miserably, including De-Bond. 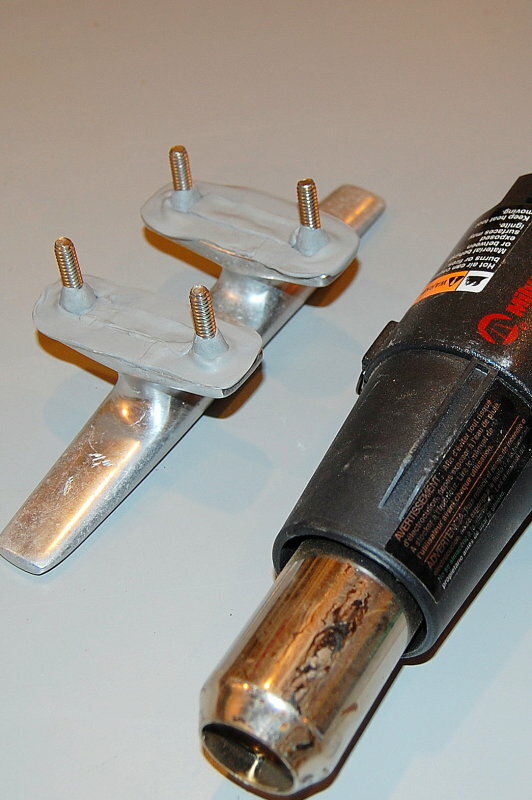 #5 Tube Caulks - When you need to use a tube caulk for deck fittings choose one with LOW ADHESION. Polysulfides like Life-Calk are generally the lowest in adhesion but Sikaflex 291 @ 260 PSI and 295 UV @ 160 PSI are both less than 3M 4200 @ 300 PSI or 3M UV 4000 @ 300 PSI and a better choice IMHO. I generally prefer Sikaflex 295 UV for deck stuff and Sika 291 for below water, both 295 UV and 291 are polyurethanes with a 500% elongation rating. TropicCat, robertluster, Cal28 and 23 others like this. © Images In Posts Property of Compass Marine Inc.
Last edited by Maine Sail; 09-21-2018 at 07:30 AM. Excellent MS, that should cut down on the PM's. Great pics. I might add that on a hot summer day butyl tape can be brutal to work with because it stretches so easy. As said above do not use the black butyl tape as it will stain your boat. I had a dream, I was sailing, I was happy, I was even smiling. Then I looked down and saw that I was on a multi-hull and woke up suddenly in a cold sweat. Outstanding tutorial! I've been waiting for this one. If you don't mind, I'll make it a sticky. This will make it easier for everyone to find and should also cut down on the PMs to your account. truckmen and HardTAC like this. truckmen and rackham the red like this. Now If I could only stay away from working on the damn things I could sail more! Another Grrrrreat post in a long line of them. ".. there is much you could do at sea with common sense.. and very little you could do without it.."
While their prices are reasonable, their shipping rates are obnoxiously high.... I would not use them. her going when she oughta fall down, tells you she's hurting 'fore she keens. Makes her a home. Still—DON'T READ THAT POST AGAIN. Done it and it works fine. It is actually easier than it seems it would be. Also good quality genny tracks have a concave sealant groove on the bottom. Tafa, oneshotonekill and Towguy like this.